Definitely a trip to remember! The Garden of England Tour was our first visit to England. 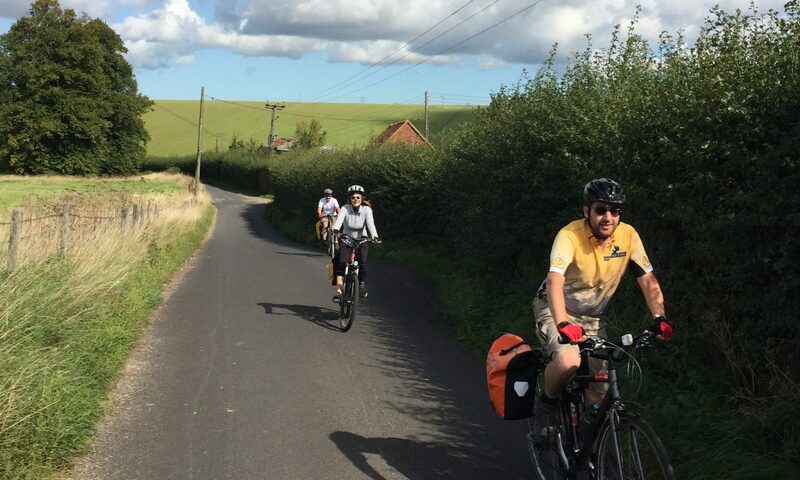 There is no better way to see Sussex, Kent or the “Weald” than by bicycle. We explored the small towns, beautiful English country side, local taverns, and marvelous tea shops. We especially enjoyed the group dinners,private tours, and the hospitality of each unique B&B. Hiking the Seven Sisters Country Park was amazing and a must when visiting Eastbourne. Andy and Cheryl were the perfect hosts! Andy did a wonderful job mapping out the courses for each day. We traveled lovely wooded roads (right out of a picture book), bike paths that avoided traffic, and dirt trails through sheep pastures with breathtaking views. Cheryl’s smile greeted us at all our stops and she always had great recommendations for dinner, shopping, and extra activities. This tour is truly unique and we definitely recommend this tour for other bicycle enthusiasts! As an occasional cyclist, I chose to use an electric assist bicycle, and was ecstatic that I chose this option. Because of this I was able to enjoy the full daily bike tour but also had energy to enjoy exploring the lovely towns/villages that we stayed in each evening. The food was amazing, and the scenery was spectacular. What a wonderful way to see the sites and tour Sussex and Kent, England. I highly recommend taking this tour with Andy as your guide.